The International Culture Tourism and Media Congress was held in southern Hatay province over the weekend to celebrate the province's cultural and historic legacy. "Hatay, a model of brotherhood, global peace and Hatay" and "Unveiling the richness of Hatay" were the main topics discussed at the international congress with the participation of local and international journalists. Hatay has hosted various civilizations for thousands of years and the congress pointed at the city's diverse and multicultural characteristics with special emphasis on its churches, synagogues and mosques. The gathering took place under the chairmanship of the Anadolu Publishers Association and with the cooperation of Hatay Municipality, the General Directorate of Copyrights and HRT Mediterranean. Putting emphasis on the different religions and ethnic identities cohabiting peacefully in the city, it underscored that the city of civilization, where common history and common culture have melded, is exemplary with the wealth derived from differences and its tradition of coexistence. Speaking at the inauguration of the congress, ruling Justice and Development Party (AK Party) Deputy Chair Numan Kurtulmuş, who also previously served as a culture and tourism minister, highlighted that Hatay is important for being a key city in Anatolia. Stressing that Hatay is the center of great civilizations, Kurtulmuş said, "Hatay is a city where many different religions, beliefs and lives live together, and it is an example for the whole world as a model for the culture of cohabiting peacefully." 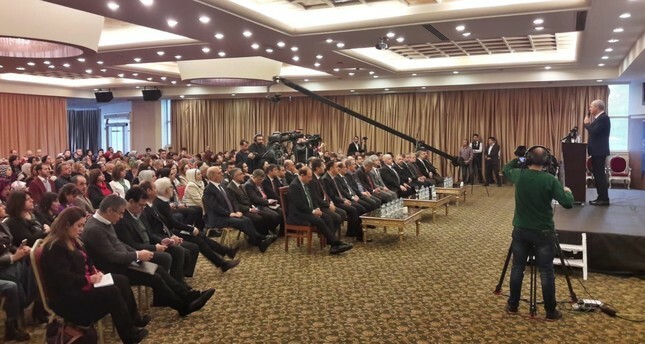 Pointing out that 30 percent of the population of Hatay is Syrian, 300,000 registered and 100 living in camps, Hatay Governor Rahmi Doğan underscored that people of the city have strong feelings of kinship and brotherhood. "Syrian children and the children of Hatay are studying in the same classrooms," he added. Especially, in recent years, the city opened its doors to Syrian refugees following the civil war in the neighboring country. In relation to the issue, AK Party Hatay Deputy Hüseyin Yayman stressed that they are striving to promote Hatay, the cradle of civilizations, throughout the world by showcasing the city's contributions to peace and history. In her speech at the "Global Peace and Hatay" panel of the congress, Daily Sabah Ankara Bureau Chief Nur Özkan Erbay noted that democratic and prosperous countries in the world are currently experiencing social differentiation and conflict. She added that with its values and future, Hatay, however, stands out as an exemplary city for these countries in terms of global peace. She also underscored the importance of Hatay in maintaining regional security. Along with its history dating back 4,000 years, Hatay is one of the greatest guardians of Anatolian heritage. Abundant with history and hosting different religious and ethnic groups, Hatay is one of the key points for both the East and the West. It is the point where the Arabian and Anatolian peninsulas intersect. The term Christianity was first used in Hatay. Several of the Gospels were written in the city. Some of the apostles of Jesus Christ settled in Hatay. One of the first mosques in Anatolia, the mosque named after Habib-i Neccar, which is also mentioned in the Quran, is also situated in Hatay. Crowned by firsts, Hatay is where the world's first church, St. Pierre Church, and the world's first illuminated street are found. The only Armenian village in Turkey, Vakıflı village, is in the Samandağı region of Hatay. Today, Jews and Christians are still living in the city that has hosted hundreds of civilizations and religions throughout history.